Modernism has a mixed reception in the United States. Especially in residential design, it is equally despised and beloved. There are loads of historical reasons for this, filling volumes of treatises and endless hand-wringing by architects. 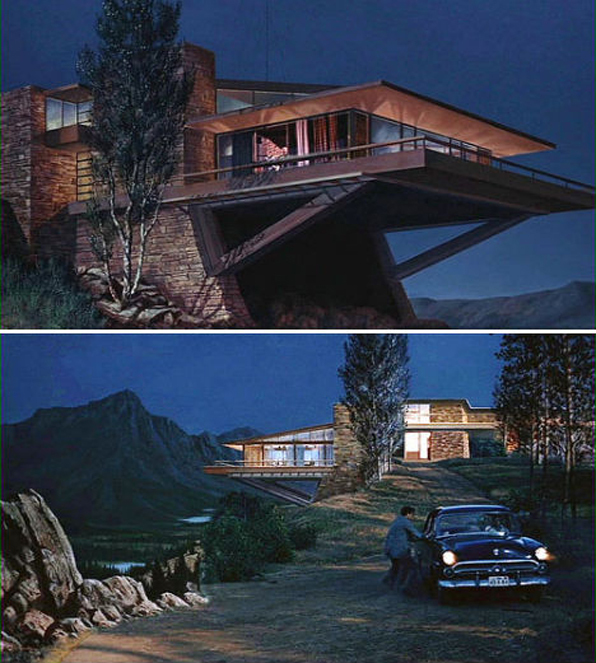 I have always felt that it was corporate America's embrace of the industrial aesthetic of Modernism that most distinctly became the focus of opposition for most folks image of "home". A television commercial from a few years ago depicts Alex Baldwin within the lair of some arch-villain. Although brief and glimpsing, I am pretty sure the surround, the lair itself, is the recently renovated (but not yet open) TWA Terminal originally designed in all its swooping mid-century elegance by Eero Saarinen in 1956. And such it is for most evil-genius hideouts - they are triumphantly, arrogantly Modern. The movie-face of evil chooses Modern digs. The James Bond movies are the prime example for this, but certainly not the only one. Ken Adams, the supremely-talented, architecture-educated set designer for most of the Bond movies placed almost all of Bond's foes in ostentatious Modern environments. Even deep within Goldfinger's Kentucky horse farm, a kind of Modernist swinging-bachelor pad lounge houses the villains and mafia cohorts. It is not just their high-tech control rooms, but their living spaces as well that baddies like kickin it with their henchmen. In the end, Bond will inevitably blow up all of these evil lairs as killing the villain is clearly not sufficient to extinguish his evil. The architecture itself, as a co-conspirator to attempted high-tech tyranny, must also be destroyed. Bond is indeed is Her Majesty's Service, the Arch-Angel Michael, avenging Great Britain and the order of the old world against the nouveau riche excesses of technology and "progress". Maybe Bond's campaign against Spectre is merely a thinly-veiled attack on Modernism itself, with Prince Charles and Bond extinguishing the consistently foreign, and Modern, foes. The popular culture attack on Modernism is not solely attributable to Bond movies alone. 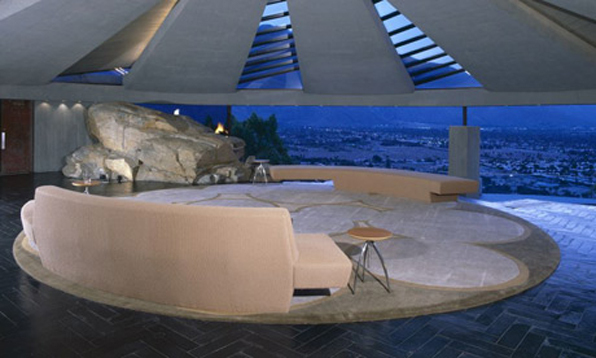 Hitchcock's 1959 North By Northwest famously serves up another evil lair, Vandamm's Usonian inspired Modernist house. Is this another attack on Modernism, this depiction clearly the American version, by a Brit? The dramatically Modern hideout of villains has of course now become part of the genre and an easy target of some quite funny renditions. Not much to be said of these except that no indications of traditional domesticity are allowed for evil to prosper. I have grown up with these Bond movies and must admit there is something profoundly satisfying in the inevitably outcome of the total destruction of these environments, the complete erasure of a singular vision of money and power and hubris. 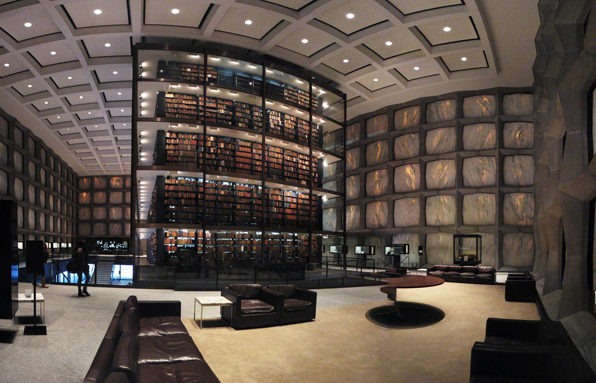 As a final note, I have long felt that the best evil lair for a bibliophile villain must be Yale's Beinecke Library. Designed by Gordon Bunshaft, it has all the trappings of that singular, Modernist vision, even to point of allowing no windows to display the less-than-perfect and frankly untidy and traditional, outside world. You can almost hear the crazed classical organ fugues reverberating through the space. For as much as the buildings, furniture and fittings of Modernism became the sign of evil genius run amok, the music associated with these movie madmen never strayed to Sinatra or Martin Denny's space age bachelor pad lounge music. I guess if you need the drama to wipe out much of the human race, you prefer Bach to Herb Alpert's Tijuana Brass. Up next: the architecture of heros - Goodness, Nature and Vengeance.